The K&N 77 Series high flow performance metal air intake kits for pickup trucks and SUV's combine outstanding performance with under-the-hood style. If performance and horsepower aren't enough, the visual appeal of air intake shining under your hood should make you a believer. The metallic finishes of the 77 series air intake are bold and beautiful. Factory air intake systems can restrict air flow between the air filter and the engine, reducing the benefit of a K&N Air Filter alone. This weak spot can seriously reduce airflow and rob a vehicle of its natural horsepower. 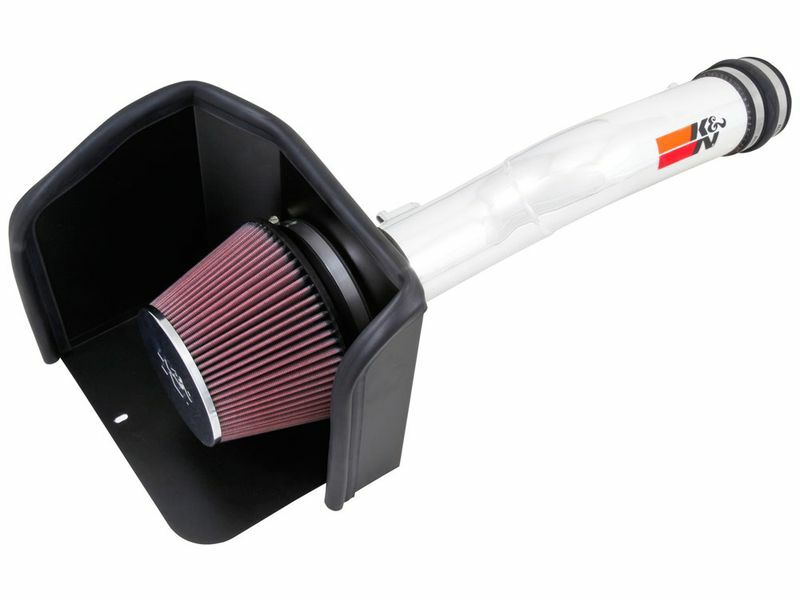 K&N 77 Series air intakes virtually eliminate air path restriction by replacing the air filter and the entire air path to the engine with a mandrel bent aluminum tube. The aerodynamically engineered K&N aluminum tube drives a large amount of air into the engine, ultimately giving you power. These air intakes are available with polished aluminum or gunmetal grey powder tube finishes, designed to exceed your expectations and then some. With an oversized high-flow conical air filter design, this system increases surface area and dust capacity. 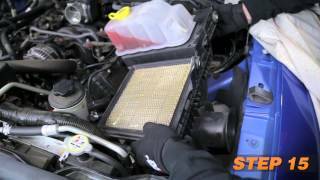 The oversize air filter is also designed to capture more dirt giving a longer life before cleaning and upkeep is required (up to 100,000 miles). Most K&N 77 Series High Flow Performance air intake systems feature a heat shield, offering sealed protection to block the system from engine heat. Keeping the air that flows into the engine at a lower temperature will increase horsepower. The silicon or reinforced nylon air intake adapters are high strength, ensuring a long life. These kits come standard with powder coated steel brackets. 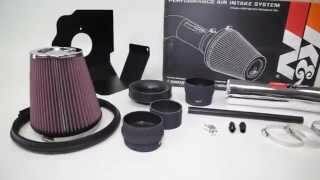 K & N Filters is long known to be a leader in the automotive aftermarket parts arena. K&N 77 Series high flow performance metal air intakes are going to boost horsepower, torque and acceleration, all while adding a great style to your engine. Get the most out of your car or truck - Most people are aware that our High-Flow Air Filter can increase horsepower over a traditional disposable air filter. An air filter change alone however, cannot eliminate other types of air restriction built into the vehicle at the factory. These can be found in the size of the air box and the air path running from the air box to the engine. That’s where air intakes rule the road. They completely replace the factory airflow assembly including the filter, air box and air path. K & N will not sell an air intake that does not provide a measured increase in horsepower and torque (acceleration). Our air intakes are proven to increase horsepower and torque on a rear-wheel dynamometer (think treadmill for cars). These thoroughly engineered air intakes provide huge increases in power that a customer will definitely feel when they accelerate. K&N Intake Kits are guaranteed to Increase Power! Every Intake Kit K & N designs has been tested on a dynamometer and proven to increase horsepower. We measure horsepower at the wheels. The horsepower rating that may have been on the window sticker when your car was new is often a measurement of horsepower at the engine and there can be a loss of horsepower through the drive train by the time it reaches the wheels. The K&N air intake system must have been properly installed on the vehicle in accordance with the included K&N instructions. The system must be the correct part number for the vehicle upon which it was installed. The vehicle must be in good running condition. The vehicle must undergo a dynamometer test both before and after the installation of the system, with no changes to the vehicle, except for the installation of the kit. The dyno tests must be performed by the same testing facility and must be performed within 30 days of one another and within 60 days of the date of purchase. The test results or work order for each test must reflect the name and address of the vehicle owner or operator having the test performed; the year, make, model and mileage of the vehicle being tested; and the horsepower results from both tests. If the dyno tests show that the vehicle did not gain an increase in horsepower, then the retail purchaser must return the complete air intake system to K&N in its original packaging, together with his or her proof of purchase, the ORIGINALS of the two dyno tests statement requesting a refund in accordance with our Horsepower Guarantee. Upon receipt of all of the foregoing, K&N will refund the full purchase price, including sales tax, to the original retail purchaser. This guarantee does not apply to any other costs incurred by the purchase, including, but not limited to, the dyno tests, parts and labor for the installation and removal of the air intake system, shipping costs, rental car, loss of use or incidental damages, if any, and K&N expressly disclaims any and all liability for same. K&N 77 Series high flow performance metal air intakes offer an easy installation that can be done right at home. Each intake is designed to replace the OE intake, using the same mounts and holes. Instructions and hardware will be included with each order, and install directions are also available on our site. If you have any questions, let us know at 877-216-5446.